At a conference recently, I was approached and asked for advice about resources for using skype in the classroom to connect with schools in other countries. I started to answer the question with a specific suggestion (the Cool Cat Teacher’s Flat Classroom) when I stopped myself and took another tack in my advice-giving. Instead, I suggested, I encouraged him to join the online community of educators, to join the network, and to be empowered to learn continuously rather than in discrete lumps. Teach a man to fish and feed him for a day. Teach a man to fish, and feed him as long as the fish supply holds out. But create a collective, and every man will learn how to feed himself for a lifetime. 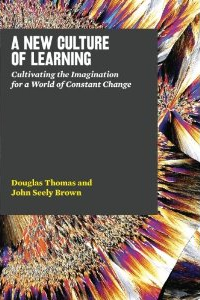 I am quoting from a brilliant new book, A New Culture of Learning, by John Seely Brown and Douglas Thomas. Learning in an age of constant change simply never stops. In the new culture of learning, the bad news is that we rarely reach any final answers, but the good news is that we to play again, and we may find even more satisfaction in continuing the search. Learning is everywhere– omnipresent and omnichronous– and if we who lead learning inside our school-houses refuse to recognize and harness this, we do so at our peril. What I was especially struck by in this highly readable book (I read it in about 75 minute straight through, unable to put it down) were the two chapters on “the collective,” struck because of the resonance I found therein with what has been my own enthusiastic experience of participating in a “collective” in exactly the manner described within the book. In communities, people learn in order to belong. In a collective, people belong in order to learn… Thanks to digital media, the range of available collectives is almost limitless. They constitute an ocean of learning. The power of a blog rests in part with the author or authors who start it; in part with the readers who leave comments; in part with those who link to, cite, reference, or respond to it; and in part with the readers, who may do nothing more than have their presence recorded by a web server. At their best, blogs give an individual the chance to interact with and become part of a collective that both shapes and is shaped by his or her thoughts. Blogs, by their very nature, are tentative works in progress. They have the character of playfulness, which is core to the new culture of learning. Blogs can be experimental in nature, used to test and refine ideas. But at their base, they serve as a means to kick-start a collective around conversations about ideas. Blogging as a part of Connected Principals has been for me exactly all of these things; it is as if the authors had observed my experience and interviewed me at length to write these paragraphs. I belong in order to learn, and the meaning of what I learn is greater because I interact with and become part of a collective that “both shapes and is shaped by” my thoughts. Blogging for me is thinking out loud; it is experimenting with ideas and considering implications; it is about posing intellectual hypotheses, sometimes tentatively and sometimes with exaggerated hyperbole (see Salman Khan, Transformer), so that I can better test and refine my ideas and understandings. Without a doubt, the emotional and learning power of blogging in this collective is in the dynamism and diversity of its eco-system: in the authors who started it and write for it, in the readers who leave comments, in the tweeters who link to it, and even in the “lurkers” who just observe, but who are recorded as site “views.” To all of you, thank you. How do we do we improve our efforts to share and bring the power of the “blogging collective” and the “new culture of learning” with and to our students, our colleagues, and the entirety of our school learning communities? Thanks to Thomas and Brown and thanks to Connected Principals, my vision is clearer, my inspiration greater, my understanding deeper, my confidence richer, and my enthusiasm stronger: onwards. Thanks for this. The “teach a man to fish” is a very old adage of course. I had not realized that JSB and Thomas used “collective” in that way. I wish for a better term. Maybe “connective” although we do use community for folks drawn together for a common purpose, including learning. Communities of practice come to mind. I am thinking of the dynamic, ad hoc constructions of community that arise and dissipate more-or-less spontaneously. We can be participating in any number of those, such as those discussing this book and garnering inspiration from it. The internet allows the low-friction creation of these communities and social networking seems to be just one structure in which such overlays ebb and flow. The new culture is that of learners, but the mainstream of teachers still lags far behind. The problem lies in teacher education and the woeful failure of colleges of education to wake up the current realities. The age of constant change is a myth because all of human history is an epoch of constant change. That is the great truth that is revealed by the crisis in current rigid educational praxis. Brown and Thomas are correct in assessing the good news, but incorrect is seeing it as something new. Humans cannot help being human and humanity is characterized by constant learning in the face of mere survival.Adaptation and learning is the fact of the Darwinian view. It is only in the sense of formal education that we can talk about failure outside the boundaries of natural selection. The most damming myth lies in the belief that there are final answers (canon) and that those answers take precedent over process. pls see http://www.newcultureoflearning.com/community2collective.pdf for a paper discussing the critical differences between community and collective by doug thomas.